If you are 70½ years old or older, you can take advantage of a simple way to benefit Syracuse University and receive tax benefits in return. You can give up to $100,000 from your IRA directly to a qualified charity such as ours without having to pay income taxes on the money. Q. I've already named Syracuse University as the beneficiary of my IRA. What are the benefits if I make a gift now instead of after my lifetime? A. Yes. Direct rollovers to a qualified charity can be made only from an IRA. 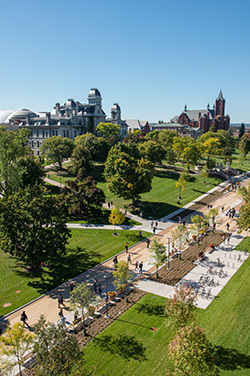 Under certain circumstances, however, you may be able to roll assets from a pension, profit sharing, 401(k) or 403(b) plan into an IRA and then make the transfer from the IRA directly to Syracuse University. To determine if a rollover to an IRA is available for your plan, speak with your plan administrator. It is wise to consult with your tax professionals if you are contemplating a charitable gift under the extended law. Please feel free to contact Lynne Marie S. Jones, CFRE at 888.352.9535 or GiftPlan@syr.edu with any questions you may have.